It is nearly that time of year, and many of us have a long list of people we need to start making gifts for. This can sometimes be a bit daunting given all of the other responsibilities in our lives. To help reinvigorate your idea-stash, we have compiled a few projects that aren’t just quick, they’re practical and beautiful–and great fun to make. Who doesn’t love a new scarf or hat? Many of your friends and family would love to receive new cozy woven wear. Make a lovely neck-warmer that utilizes a woven-in slit to allow the other end of the scarf to be threaded through it. This new take on a scarf is a great gift for both the gals and guys in your life. Another neck-lush project comes from our Zoom Loom project page featuring the infinity cowl with a simple crocheted border. You can customize this pattern for your recipient. We’ve used a yarn with a gradual color change, but you could try alternating squares of bold colors…or just use one yarn for all of the squares and highlight with a contrasting crochet edge. For another funky hat, break out your zoom loom and stash yarn to make this Pixie Hat Overlapping squares make up the crown, with the edging squares folded up for a brim. It’s all trimmed with a couple of squares-pompom style. 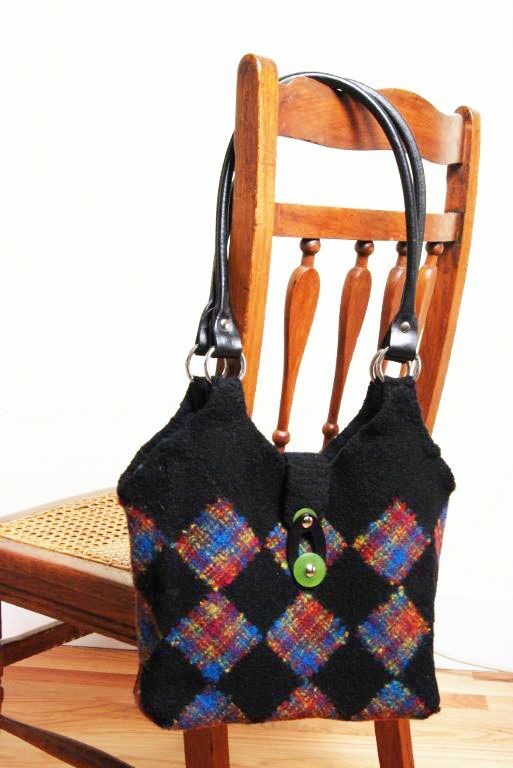 An upscale felted bag ready for a night on the town. Here, two differentyarns are woven into squares on the Zoom Loom. The whole thingis assembled and then felted for a sturdy and stylish bag. To makesure your bag felts, be sure to use a non-super wash wool. You mayfind that this will be one gift that might be hard to part with. For the Home:Here are some ideas to give to new home-owners or your friends and family who have just too many hats and scarves. All are simple and can be interpreted in so many ways. We encourage you to explore and play to create personalized gifts. For the host or hostess of your next holiday party, you might think about weaving this bag. This is simple: just weave a long rectangle, hem the top and sides, and tie up with a pretty ribbon. If you have a yarn stash, and who doesn’t, dig into to create textured fabrics or playful checks or plaids. Make a house more of a home with these pillow coverings found in the Yearning to Weave Newsletter. If you’ve never woven a spot lace weave–whether on your shaft loom or rigid heddle–this smallish project is a manageable way to try something new. Put on a long warp and try different patterns and weft colors for a variety of projects all on one warp. By the way: for weaving efficiency, weave as many projects as you can on a single warp. It really saves time. We have kids covered in this guide as well, from the babies on up. This Zoom Loom Dolly can be made to look like your kid, or their favorite cartoon characters, the only limit is your imagination. Squares are woven for the body and jumper. 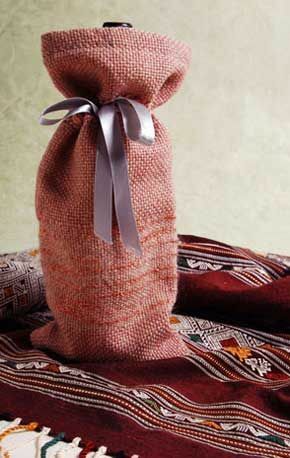 The eyes and mouth are embroidered and the hair threaded through the fabric for an irresistible little doll. For the younger children in your life, these blocks are a fun way to use up stash yarn and can be made on even the simplest of looms: Zoom Loom, Mini Loom, School Loom, Flip, or Cricket Looms. For older children–and even adults– make some bean bags for an afternoon of fun. Weave these up in bright kid colors as party favors.